Ah, Virginia! This southeastern state is a true gem of the U.S. The stunning mountainscapes and sprawling Atlantic coastlines make for breathtaking scenery, and as one of the original 13 colonies, it’s a goldmine for history buffs. It’s also jam-packed with charm and culture! Add all of this together, and you’ve got an RVers dream destination! To show you what we mean, we’ve put together this free Virginia RV travel guide; you can come up with some fantastic trip ideas and explore all that this marvelous state has to offer! 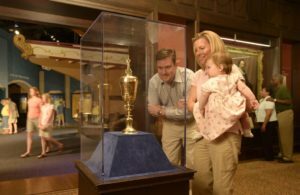 We mentioned that Virginia is a historical treasure; the Jamestown Settlement is the perfect addition to your RV trip itinerary to showcase that. This living history museum lets visitors experience what life was like in the first permanent English colony in America. Gallery exhibits show what Jamestown was like in the 17th century for the European, African, and Powhatan Indian cultures who made this Settlement what it is now. You can explore detailed replicas- including three ships that sailed from England to Virginia in 1607, a Powhatan Village, and a colonist’s fort. If you visit at the right time, you’ll even be able to see thrilling reenactments of military tactics, artillery firing drills, American Indian Powwows, and more! Price: General Admission is $17 for adults, $8 for kids. A ten-minute drive is all it takes to find a quality campground near Jamestown Settlement. Chickahominy Riverfront Park is home to over 120 campsites, many of which have fantastic views of the Chickahominy River. With site facilities ranging from basic to full hookup sites, there’s something for every type of camper- and rates start as low as $28. What a steal! Next up on our list is without a doubt one of the best stops for RV Trips in Virginia. Busch Gardens in Williamsburg is the epitome of a good time; with exhilarating roller coasters, phenomenal dining opportunities, and numerous shopping options. Overall, it’s just a perfect way to have a blast with the ones you love. Busch Gardens isn’t just a theme park though! It’s also a place to learn about the wonders of nature. Bald eagles, gray wolves, and draft horses are among the beautiful animals on display. In addition to that, Busch Gardens also lets you explore the world! Enjoy the classic Europe theme as you travel through Italy, Scotland, Germany, England, France, and Ireland. There’s plenty waiting for you to see and do at this magnificent park! Price: Prices vary. Summer fun cards that allow you to visit multiple times are available for $60. American Heritage RV Park in Williamsburg is definitely the perfect place to stay during a visit to Busch Gardens. The grounds are beautifully kept, the amenities are numerous and unique, and the facilities are top notch. In fact, American Heritage RV Park even made it onto our list of the 10 Best campgrounds in Virginia! Rates start at $54.25 per night. Another famous historical site in Virginia is Monticello, the home of the third president of the United States, Thomas Jefferson. It’s much more than just that though! It’s also a museum, presidential library, historical plantation, research institute, and a non-profit organization. Take a tour of the house that Jefferson had built back in 1769, experiencing the marvelous architecture that showcases what Jefferson valued in life. Take in the wonders of the botanical masterpiece that was used as a food source and experimental laboratory of plants from around the world. There’s plenty to see and do, including numerous tours and events that are the perfect addition to anyone’s Virginia RV road trips. Price: Day pass and house tour starting at $22 for adults, $10 for kids. Online discounts are available. For a five star experience close to Monticello, you’ve got to stay at Charlottesville KOA. This RV park is popular for good reason; a pool, wireless internet access, cable TV, and pedal kart rentals are just a few of the amenities that make this campground so spectacular. And you can stay for a price as low as $39 per night! If you’ve been searching for the perfect Virginia destination for RV trips with kids, look no further! The Virginia Aquarium & Marine Science Center has over 800,000 gallons of fun that will mesmerize people young and old! Meander through spectacular habitats, including the Marsh Pavilion where you can see river otters, snakes, and other marsh creatures, the Bay & Ocean Pavilion that’s home to the diverse life that’s native to the state, and the Owls Creek Path, which winds through a woodland preserve and salt marsh. You can even experience some thrilling adventure while you’re visiting the Virginia Aquarium. The Adventure Park features an eco-friendly zip line and aerial adventure course high in the trees above Owls Creek. Tickets for this exciting experience are sold separately and start at $39. Price: Admission is $24.95 for adults, $19.95 for kids. Discounts are available for seniors, and infants 2 and under are free! Outdoor Resorts RV Resort is only a thirty-minute drive from the Virginia Aquarium, but that’s just one of the great things about this RV park. You can walk to the beach from your campsite to enjoy the sunrise or sunset, there’s a dog walking area for your four-legged friends, tennis courts for a friendly match, and multiple bathhouses and laundry facilities for your convenience. Prices aren’t shown clearly, but nightly rates start at $68.40. 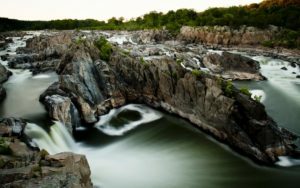 Great Falls Park is the perfect testament to the overwhelming beauty of Virginia and shows why RV vacations are so popular there. This National Park is nestled on 800 acres on the banks of the Potomac River. There are three breathtaking waterfalls overlooks in the park, two of which are wheelchair accessible. There’s plenty to see and do, both outdoors and indoors at this National treasure. For those with an adventurous spirit, try whitewater canoeing and kayaking, hiking along fifteen miles of trails, and biking down five miles of trails. For something a little more relaxing, bird watching is a popular choice, as is exploring the Visitor Center, which offers a museum, slideshow, and children’s room. Price: $10 admits entrance to an entire vehicle for up to three days! About an hour from Great Falls Park is a marvelous campground located in Prince William Forest Park. While it may be a bit of a drive, it’s definitely worth it. Guests at Prince William Forest RV Campground get to enjoy the beautiful forest, a swimming pool, hot showers, laundry facilities, and more, all for the low nightly rate of $36! When we said that Virginia is a goldmine for history buffs, we meant it! Mount Vernon is yet another historic destination, this time it’s the home of one of the most popular men in history- none other than the first president of the United States, George Washington! When you visit Mount Vernon, you’ll be able to explore what was once a working plantation in the 18th century, and is now a hub for learning about the history of our founding father. The house itself is an authentic representation of where Washington and his wife lived, and the surrounding grounds and gardens are beautifully kept. Along with viewing the grounds and home, you’ll be able to visit museum galleries, enjoy fine dining, and get swept up in immersive programs. Price: Admission is $20 for adults and $10 for kids. Discounts are available for seniors and military, and for purchasing tickets online. Prince William Forest RV Campground is once again a great place to stay! 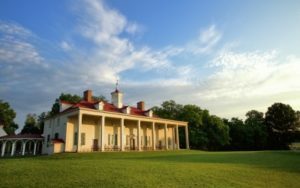 It’s less than an hour from Mount Vernon, and as mentioned, the rates start at $36 per night. However, if you want more options, there are plenty more great RV parks in Virginia to choose from! For a unique adventure, you’ve got to visit Shenandoah Caverns. Explore the world beneath ground level as you tour Virginia’s only cavern with elevator service! Admire the natural formations that are unlike anything you’ve seen before. In fact, the “Breakfast Bacon” formation is so unusual that it has been featured in National Geographic magazine! The Caverns are a constant 56 degree Fahrenheit so you can visit year round- but you might want to bring a sweater in case you get chilly! Aside from the Caverns, you’ll also have the opportunity to experience the other attractions, The Yellow Barn, American Celebration on Parade, and Main Street of Yesteryear. Price: Admission is $24 for adults, $21 for seniors, and $12 for kids. AAA and military discounts are available. 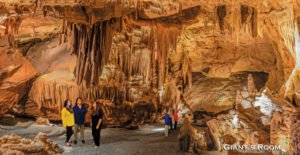 Shenandoah Valley Campground is so close to the Caverns that you could walk. That’s right, it’s only a two-minute drive! To sweeten the pot, though, the amenities are out of this world. Mini golf, free WiFi and cable, a community campfire, and a camp store are just the tip of the iceberg. The icing on the cake though? You can stay at an RV site for as low as $37 per night! Twenty miles north of Richmond, Virginia is one of the perfect destinations to add to your family RV trip planner. 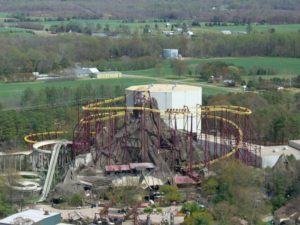 Kings Dominion is one of the best amusement parks in the country! With tons of roller coasters, thrill rides, kids rides, and family rides, it has something for everyone to enjoy. The rides aren’t the only thing that Kings Dominion brings to the table though. World-class entertainment and shows bring a special touch that really made this theme park shine. Enjoy some hearty laughter as you watch The Clown Band wander the park getting into hilarious shenanigans, or watch the PEANUTS gang put on a one of a kind show at their playhouse in Planet Snoopy. That’s just a taste, though. If you make Kings Dominion a stop on your trip, you’re guaranteed to have a blast with the 60+ attractions they offer! Price: Single day tickets are available as low as $39.99! If you want to stay somewhere close to the theme park, the Kings Dominion KOA is a no-brainer. They offer free shuttles to the park, a pool, and free WiFi. You can even pick up RV rentals in Virginia near the campground! Rates average around $40 per night, depending on which site you want and what time of year you make your trip. If you’re planning on taking a trip during the summer, you’ll definitely want to head to Water Country USA. This family-friendly waterpark has eleven slides and rides, complete with thrills and relaxation. For a relaxing day, you can float down the lazy river, chill out under a private cabana, or take a dip in the wave pool beach. If you’re looking for more adventure, you can race your friends on Nitro Racer or zoom down the Jet Scream, which is a 400 ft. waterslide that’ll let you reach up to 25 mph. 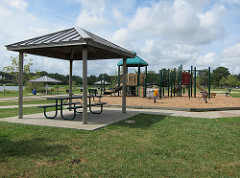 Even little ones can enjoy the time at the park; there’s plenty of water playgrounds built just for them! As an added bonus, Busch Gardens is only three minutes away, so you can visit both amazing parks in one trip! Price: Single day tickets are $60 for adults and $53 for kids. Since Water Country USA is so close to Busch Gardens Williamsburg, American Heritage RV Park is a great choice of RV park for both! As mentioned earlier, the rates start at $54.25 per night. That’s a nice deal considering the great amenities it offers, and especially for being so close to two major Virginia attractions! We’ll round off our top 10 list with an attraction that’s truly unique- Mount Trashmore Park. This city park is situated on 165 acres and is home to lakes, playgrounds, a skatepark, and a vert ramp. What makes this city park so special you may ask? It has two manmade mountains made out of, as the name might suggest, trash! The largest of the two is 60 feet of compacted layers of solid waste and clean soil. It’s the perfect example of landfill reuse. Adding to the environmental friendliness is the garden that features xeriscaping, which minimizes water usage. At Mount Trashmore Park, you can spend the day bonding with your loved ones as you enjoy the numerous amenities, including volleyball courts, fishing spots, horseshoe pits, skate park, walking paths, and more! North Bay Shore Campground in Virginia Beach is a cozy campground that’s about thirty minutes from Mount Trashmore Park. The beach is nearby, which means you can spend your trip surfing and swimming in the ocean. A swimming pool, hot showers, and a dump station are all included in the low starting rate of $30 per night. Virginia is a fascinating state with plenty of opportunities for adventure, no matter what your interests are. From enjoying the natural world to learning the rich history of the land, to getting your fill of adrenaline, you can do it all in this beautiful state! It’s no wonder why Virginia is such a hotspot for RVers. Now you can experience this magical place for yourself with some of the exciting destinations we’ve covered. Decide where you want to visit, and hit the road! Your adventure is waiting!